I’m delighted to announce that Dan McLerran at Popular Archaeology and I are creating a phenomenal tour of archaeological sites in Israel that I will be guiding October 2013. I invite you to join us on this adventure, 12 days of touring in Israel, where we’ll cover the famous sites like Megiddo and Hazor and uncover some of the less well-known gems like Sussita-Hippos, one of the Decapolis cities overlooking the Sea of Galilee that was destroyed in the earthquake of 749CE and never rebuilt. We’ll start by going back 6500 years to the Chalcolithic period and tour up on the Golan Heights to learn about burial at that time. We’ll see dolmens, the megalithic tombs consisting of a flat rock resting on two vertical rocks that mark a grave. 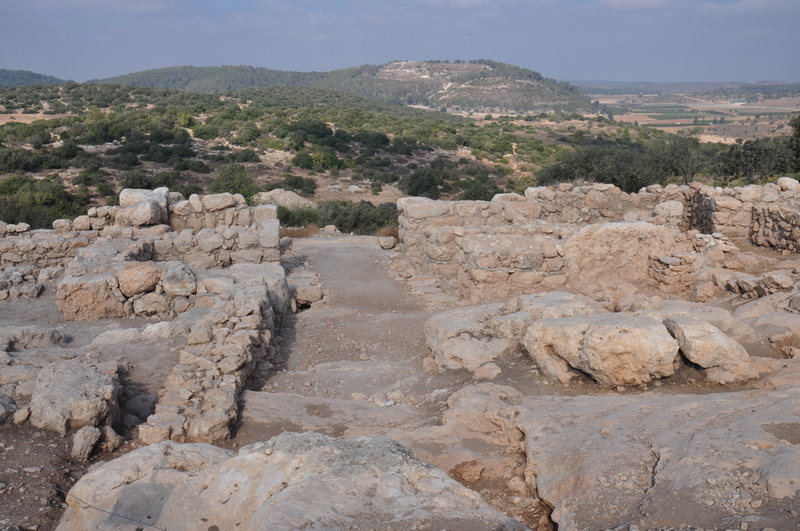 We’ll hike to the cultic site of Rujm el Hiri – is it a site that is connected to the calendar or to burial? At Ein Gedi we’ll see the ruins of a Chalcolithic temple. We’ll see artifacts at the Israel museum, examples of clay ossuaries and fine bronze castings of ritual objects. We’ll follow in the path of the Kings from 1000BCE to 586BCE by traveling from Dan where a piece of a basalt victory stella in Aramaic was found mentioning the kings of Israel and the house of David. We will explore the City of David, the walled Jebusite city on the ridge between the Kidron and Tyropean valleys. We’ll walk through Hezekiah’s tunnel that brought the water of the Gihon spring to the Siloam pool inside the walls. From there we will follow in the steps of pilgrims to the Temple mount. Part of the 650m distance will be in Jerusalem’s drainage channel until we come out right under Robinson’s Arch. We’ll see the Broad wall, the remains of an 8 meter high wall that protected Jerusalem from the north in the time of the Kings. We’ll explore the walled Judean city of Khirbet Qeiyafa, with two gates and hence identified as Shaarayim, situated on the border of Judea facing the Phillistines. We’ll learn about the Second Temple Period, specifically the time of the Hasmoneans and King Herod who ruled under the auspices of the Romans. We’ll check out Herod’s impressive building projects. At Caesarea, we have the temple to Augustus, the protected harbor, the palace as well as a theater and a hippodrome later used as an amphitheater. At Sebaste there is another temple to Augustus. Josephus writes that Herod built a third temple at Banias. It’s unclear whether the temple was at Banias or nearby, perhaps at Omrit. We’ll visit Herod’s palaces at Masada, the Western palace and the 3 tier hanging palace on the northern end of the site. We’ll explore the palace and administrative complex at Lower Herodium and the palace/fortress on the top of a manmade mountain where the base of a mausoleum was discovered by Prof. Ehud Netzer in 2007. We’ll visit the newly opened exhibit at the Israel museum Herod the Great: The King’s Final Journey, artifacts from Herodium on display for the first time. We’ll also visit the Second Temple period model that displays Jerusalem at its peak just before its destruction at the hand of the Romans. We’ll visit the Shrine of the Book that houses the Dead Sea scrolls and other artifacts and combine that with the archaeological site of Qumran by the Dead Sea where the scrolls were found. We’ll focus on the architecture of sacred space and check out various churches, in the basilica and martyrium form from the Byzantine period (4th to 7th century) and synagogues from the same period. We’ll see some amazing mosaics by visiting the museum at the Inn of Good Samaritan, the archaeological sites of Sepphoris/Tzippori, and the synagogue at Beit Alfa. We’ll visit sites off the beaten path like the Kathisma church on the way to Bethlehem and Samaritan site on Mount Gerizim. Besides the Western wall, Judaism’s holy site, we will visit the Church of the Holy Sepulcher, the holiest site to Christianity and go up onto the Haram el-Sharif to see the Dome of the Rock and the Al Aqsa mosque, the third holiest site to Islam. We’ll travel around the Sea of Galilee stopping at sites important to Christianity like Kursi, Capernaum and Magdala. We’ll even go up to the Golan Heights to the Jewish city of Gamla, the Masada of the north. For anyone who enjoys taking photographs, there will be plenty of opportunities and as an special incentive to join the tour, participants will be able to submit their best photographs from the tour to a special Pinterest site and will have a chance to win up to $1000. for the “best photo”. If you’re interested in participating in an archaeological tour of the Holy Land, contact me. This entry was posted in Archaeology, Architecture, Jerusalem, Mosaics, Museum, Photography, Synagogue, Tomb, Travel, Water, Wine and tagged archaeological tour, ehud netzer, Golan Heights, Herod the Great, Israel, Second Temple on January 7, 2013 by Shmuel Browns.